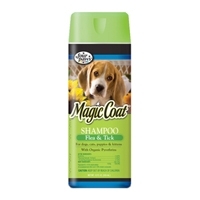 Four Paws Magic Coat Flea & Tick Shampoo for Dogs, Cats, Puppies, and Kittens 16 oz. This product has been specially formulated to kill fleas, ticks and lice on DOGS, cats, puppies and kittens without harm to their coat or skin. It is a rich, highly concentrated shampoo. It leaves the pet's coat with a beautiful luster and fresh scent.